You are at:Home»Ireland»Ireland Women»Women 6N: Who did What? Ireland Women completed their 12th Six Nations tournament of the modern era with a 5th place finish, their lowest finish since 2008, and only the second time they have not finished in the top three. It is also the first time they have only won one game. The team scored thirteen tries, including one penalty try, five conversions and one penalty, to rack up 78 points, their fourth lowest points scored over the last twelve years. The 156 points conceded is their highest ever, up 170% from last season’s previous high of 92 points. The coach used a total of 31 players throughout the tournament with 17 individuals accounting for over 80% of the minutes played. Three players, Aoife McDermott, Eimear Considine and Sene Naoupu played every minute of every game. The minutes played by each player can be viewed by clicking below. Reviewing the minutes played by club shows eleven clubs were represented, including four English Premier Clubs. There are no clubs from Ulster represented, the only province in Ireland not to have any representation, and Cooke RFC Women are the only club in the Women’s AIL not to have a single player involved. It’s hardly surprising given that there has not been a single Irish Women’s Camp in Ulster over the last four years, Over the last three season I, or any of our photographers, have yet to see a member of the Irish coaching team at any game in the Ulster or indeed at any AIL game. Given that we cover more women’s rugby than anyone, this would give a fair indication that they just don’t go. In fact I haven’t seen an Ulster Senior Women’s coach at any of the games we’ve covered in Ulster either. I don’t know what it’s like in the other provinces but clearly it’s a dysfunctional pathway for players in Ulster. 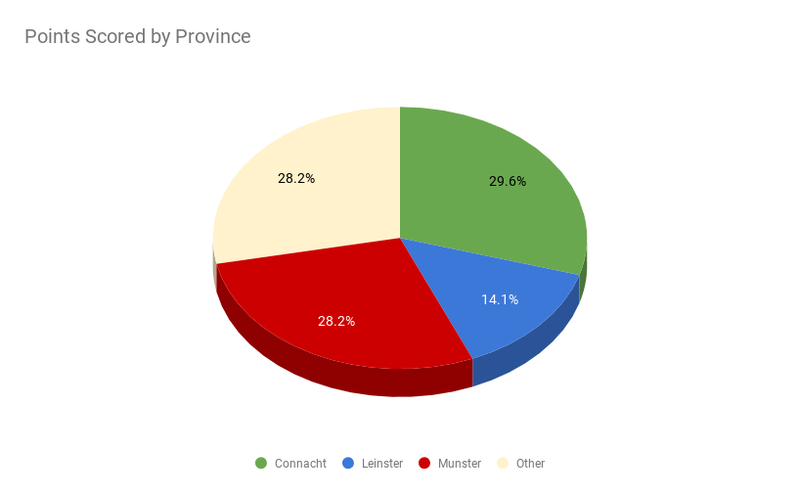 Looking at the players in terms of Province shows a slight improvement for Ulster with three Ulster players who play for Leinster clubs selected. The inclusion of Kathryn Dane, Claire McLaughlin and Claire Boles raises Ulster involvement to the heady heights of 6.9% of game time. 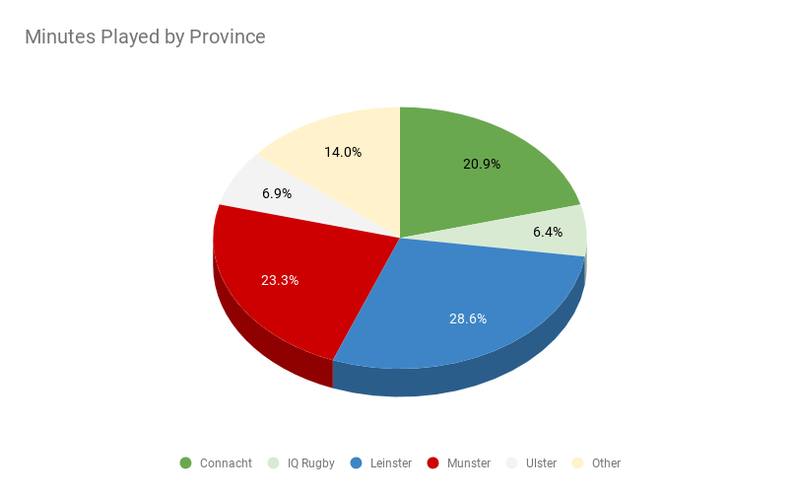 The breakdown by Province, including IQ Rugby and English Clubs (Others) is shown below. Nicole Fowley scored the most points with a total of eleven, from four conversions and a penalty. Anna Caplice and Eimear Considine were next in the list, each clocking up ten points through two tries. 47% of Ireland’s points, including a penalty try, came from the forwards with the pack claiming seven tries to the backline’s six. Excluding the penalty try, only four of the remaining 12 tries were converted giving a conversion rate of 25%. The individual scorers for this campaign can be viewed by clicking the dropdown below. On a club basis, UL Bohemian lead the way with 25.6% of the points tally. 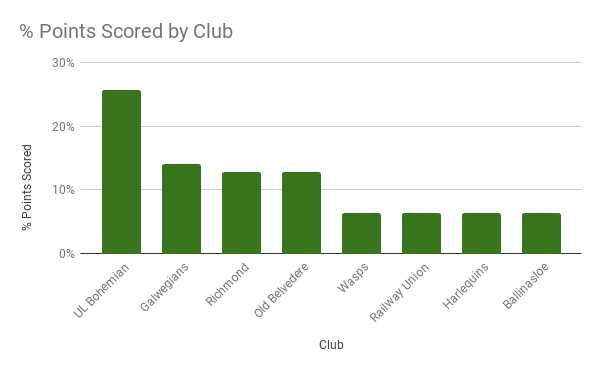 However, when it comes to provincial contribution the tries from, Connacht players Alison Millar and Beibhinn Parsons, combined with Galwegian’s total from Nicole Fowley, push the western province to the top of the points scored total. The alamingy disparaging attitude by the IRFU towards the the Women’s Club Game in Ireland, and indeed their understanding of the Women’s game in general was, once again, highlighted in a post match interview by Ireland Women’s Coach Adam Griggs who stated. “This whole competition is very tough. Our players will now go back to club rugby in Ireland and that’s not the same level as the Tyrells Premiership and the French Championship. Ignoring the fact that Ireland only played England and France once in the competition it sort of deflected over the defeats to Italy and Wales? I also believe Wales had played the same number of games as Ireland in this competition? Griggs obviously believes that the quality in the Women’s AIL is so poor that he’s better of holding player in camps as he released very few to actually play throughout the season, but, that aside, there is not this huge difference in standards from league to league and the above, from Griggs, is similar to the guff that was sprouted by losing coaches about the men’s game and the English Premiership before Irish teams started to dominate the European Cup. 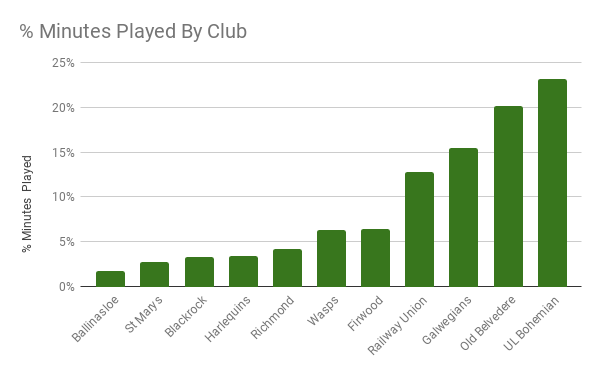 Where there is a disconnect is in the numbers of club players in England and France compared to Ireland and also in the level of support that the Unions in France and England give their club game compared to the lack of interest from the IRFU. In all the leagues there are the top three or four sides doing well and the bottom sides really struggling and in middle ground there are a group of teams who are generally losing to the top sides and scrapping amongst themselves for points. The English and the French advantage is that they have more of these middle ground teams who keep the league and the standard of the league honest. However, As far as playing ability goes, there is not that much difference between the leagues. Having watched the thrills and spills and, at times, absolute dross served up both in the Women’s AlL and the Tyrell Premiership I’m confident that the top three or four sides in Ireland playing the top three or four sides in England would not be the walkovers that Griggs imagines but hugely competitive games. Instead of disparaging the Women’s Club game the IRFU should be expanding it, to at least 10 teams. Get the likes of Suttonians, Tralee, Shannon, and Malone involved and get a proper league with a season long set of fixtures going. Attend the matches and talk to the players and coaches at the matches, show them you are there and that the pathway to the top is open and based on ability. The current system of limiting selection and keeping players in camps is not working. It’s a real struggle to see what was actually achieved at camps as Ireland served up dysfunctional lineouts and scrums and seemed to have few if any set plays, instead relying on the excellence of Claire Molloy and Ciara Griffin. The basic core skills were not improved on what is served up at club level week in and week out. Ireland Women were handled the blueprint to improving skills in the women’s game by Philip Doyle, Greg McWilliams and Peter Bracken back in 2013 and 2014 but they have singularly ignored this, instead choosing to ride on the back of players developed by Doyle and Co. for their limited successes ever since. If you’re selected for a Provincial team then you MUST be playing in an AIL side. If you’re not in one then you MUST transfer. How can you be picked for a team that’s a step down from international and playing Div 1/2/3?? The entire team needs to be dropped and everyone needs to trial. They should be picking the BEST players. Year in, year out Bohs are the top team and there are very few selected. Girls are being selected based on their previous campaigns but those same players are barely playing games so their skills are dropping. Girls were getting to Irish Camp and didn’t have basic skills. Why are those players being selected then? It’s not your skill it’s who you know that gets you into camps.